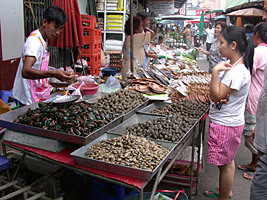 A few bivalves are also available for purchase in marine aquarium shops or pet stores or from online suppliers, especially freshwater bivalves of various sorts (freshwater pearl mussels [Unionidae] or Asian Clams [Corbicula]), and the more exotic, marine Giant Clams or Bear Paws (Tridacna and Hippopus), Flame Scallops (Ctenoides, formerly Lima), Thorny Oysters (Spondylus), and Green Mussels (Perna). 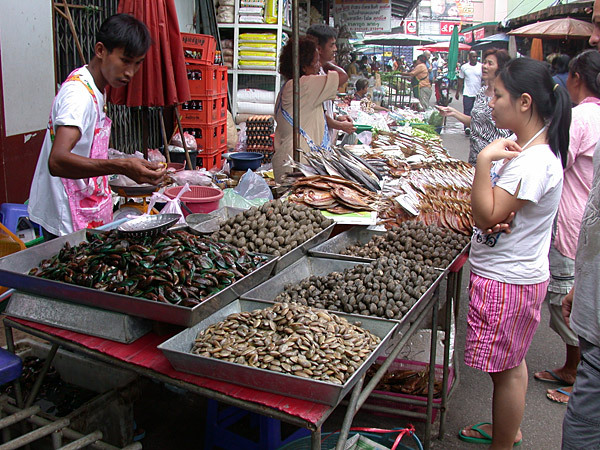 Living bivalves for sale in an open-air fish market in Chantaburi, Thailand, 2005. If you are not near a coastline, many species — especially Cherrystones (Mercenaria mercenaria), Blue Mussels (Mytilus edulis), Eastern Oysters (Crassostrea virginica), and Mahogany Clams (Arctica islandica) — are readily and inexpensively available in eastern U.S. fish markets and grocery stores. Other species are similarly available in other regions of the U.S. and around the world. Although usually kept on ice in the markets, these bivalves are alive (merchants cannot sell bivalves that are dead or gaping), and can usually be revived if placed in prepared seawater with aeration as soon as possible after purchasing. Remember that these “shellfish” are most likely marine species, so they will die if placed in freshwater. 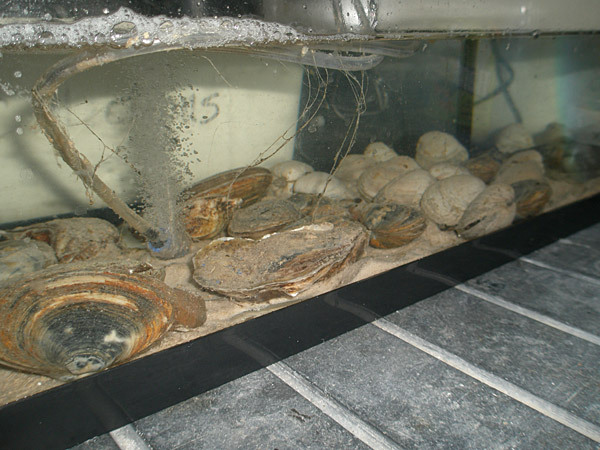 If the bivalves are to be maintained for a period of time, get them into an aquarium with water as soon as possible. Use fresh or salt water from their habitat if you collected them yourself. If you are not near a coastline with a ready supply of local water, you can use rain water or tap water for freshwater species, or purchase Instant Ocean� or some other commercially available artificial seawater mix at pet shops or aquarium suppliers. Always also use a bubbler with an air stone to aerate the water. Bivalves from the grocery store (here cherrystones, steamers, and oysters) are easy to keep for a short while in the classroom in seawater with a simple bubbler. If you intend to maintain your bivalves for awhile, you will also need to feed them. Bivalves are filter feeders, so feed them some sort of commercially available planktonic food (preferably phytoplankton) sold by aquarium suppliers. For freshwater species, a dipper of pond water will provide organic bits that can be added to the tank as food. Although a filtration system might seem logical for your tank, remember that this will filter the food out of the water, preventing your bivalves from feeding — so better not! Your bivalves need to filter the water themselves! Bivalves can be kept in aquaria with fish and other invertebrates, and generally pose no threat to these other organisms. Be aware, however, that crabs, octopuses, and larger snails will often eat bivalves. See also Suggested Classroom Activities.